Are allergies bothering your family? Our professionals keep your home free of dirt, dust, and contaminants. Schedule an appointment today! Having your air ducts cleaned on a regular basis is an integral part of your ventilation system’s maintenance, it is, however, surprisingly common to find people that prefer to put this crucial task off for as long as possible. However, doing so is not always in the best interest of your home and those who dwell inside it. A duct that is bogged down by all manner of foreign objects will not only struggle to perform in the way that it is supposed to, but could even pose some serious health and safety risks for you and your household. So if you were wondering what the big deal is when it comes to having your system sanitized, here are a few excellent reasons why you should take the matter seriously. One of the most commonly faced dangers related to dusty air ducts is the likelihood of your system contributing to a lowering of indoor air quality instead of regulating and filtering it to provide your home with clean, breathable air. Risks posed by threats of this type are the development of respiratory problems and exacerbation of preexisting issues, such as asthma. If you have a ventilation system in your home, then getting your air ducts professionally cleaned should be considered an important task that needs to be performed on a routine basis, in order to ensure your home stays free from such dangerous contaminants that can put your loved ones at risk. As far as houses and businesses that routinely use dryers, the need to have a thorough professional cleaning performed is even greater. It doesn’t take too long for regularly used systems to start accumulating more and more residues of lint. Eventually, a blockage would occur. Because dryers generally use heat to achieve their purpose, and because lint is highly flammable, you can imagine the risk of starting a fire that this could cause. So to avoid disaster, keeping your dryer vent clean of excessive lint should be considered a top priority. Whether you need commercial or residential air duct and dryer vent related services, our experts at Air Duct Cleaning Los Angeles can help. We can clean your systems to perfection and make your indoor air quality stay fresh and clean. Is Mold in My Air Ducts Dangerous? Our professionals provide air quality testing as well as dryer vent and air duct cleaning services you can trust. 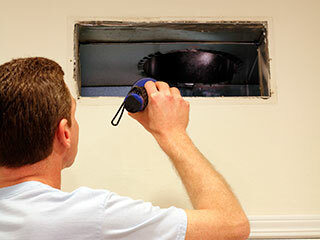 We can also help you with all kinds of ductwork repair. Book an appointment with one of our experts today! Thank you for choosing our company! Feel free to browse our website for more information in the meantime. Our team at Air Duct Cleaning Los Angeles is at your service any time!